Supine means a person is lying on her back. Prone means a person is lying face down. The cephalic region (head) or cranial region (skull) is at the top of the body and visible from the front and rear. The cervical region (neck) starts below the head, ends at the thorax, and is visible from the front and rear from below the head to the shoulders. The dorsal region (back) runs from immediately below the neck down to the area below the waist. It doesn’t include the shoulders. It’s visible from the rear. The thorax starts immediately below the neck, at the clavicles, and ends along the bottom of the ribcage. It’s visible from the front. The abdomen starts along the bottom of the ribcage and extends to the hips. It’s visible from the front. The pelvis starts where the abdomen ends and takes up the area between the hip bones. The perineum is between the thighs so very little is visible in the anatomical position. The upper extremities include the shoulders, arms, forearms, elbows, wrists, and hands and are visible from the front and the rear. The lower extremities include the hips, buttocks, thighs, knees, legs, ankles, and feet. The buttocks are visible only from the rear, but the rest of the lower extremities are visible from the front and the rear. Superior: Closer to the top of the head. For example, the nose is superior to the chin. Cephalic is similar, also meaning toward the head. Inferior: Closer to the feet. The chin is inferior to the nose. Caudal is similar to inferior, but it refers to the “tail,” or where the tail would be if people had them. Anterior: Closer to the front of the body. For instance, the abdominal muscles are anterior to the spine. Ventral is similar to anterior; it means toward the abdomen. Posterior: Closer to the rear. The spine is posterior to the abdominal muscles. The term dorsal has a similar meaning as posterior. 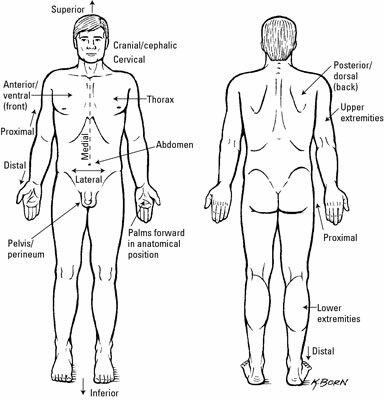 Median: At the midline of the body. The nose is a median structure. Medial: Closer to the midline of the body. The big toe is medial to the little toe. Lateral: Farther away from the middle. For example, the little toe is lateral to the big toe. Proximal: Closer to the trunk or closer to the point of origin. The shoulder is proximal to the elbow. Distal: Farther from the trunk or from the point of origin. The elbow is distal to the shoulder. Superficial: Closer to the surface. For instance, the skin is superficial to the muscles. Intermediate: In between. The abdominal muscles are intermediate between the skin and the small intestines. Deep: Farther from the surface. The abdominal muscles are deep to the skin. Unilateral: On only one side of the body, like the stomach and liver. Bilateral: On both the left and right sides of the body, such as the eyes, the kidneys, and the arms and legs. Ipsilateral: On the same side of the body. For example, the right ear and the right eye are ipsilateral. Contralateral: On opposite sides of the body. The right ear is contralateral to the left ear. Midsagittal plane: This division is a vertical plane that divides the body into left and right halves. Sagittal planes: These vertical planes are parallel to the midsagittal plane and divide the body into unequal left and right portions. There are many possible sagittal planes, so you should always give a reference point where the plane passes through. Frontal (coronal) planes: These vertical planes pass through the body at right angles to the midsagittal plane, so they divide the body into front and back. Frontal (coronal) planes can divide the body at any point, so you need to use a reference point to know where exactly the plane passes. 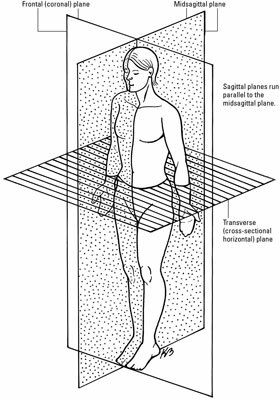 Transverse (cross-sectional/horizontal) planes: These horizontal planes pass through the body at right angles to the midsagittal and the frontal planes. They divide the body into upper and lower portions, and like the sagittal and frontal planes, you need to have a reference point to know exactly where a transverse plane lies.